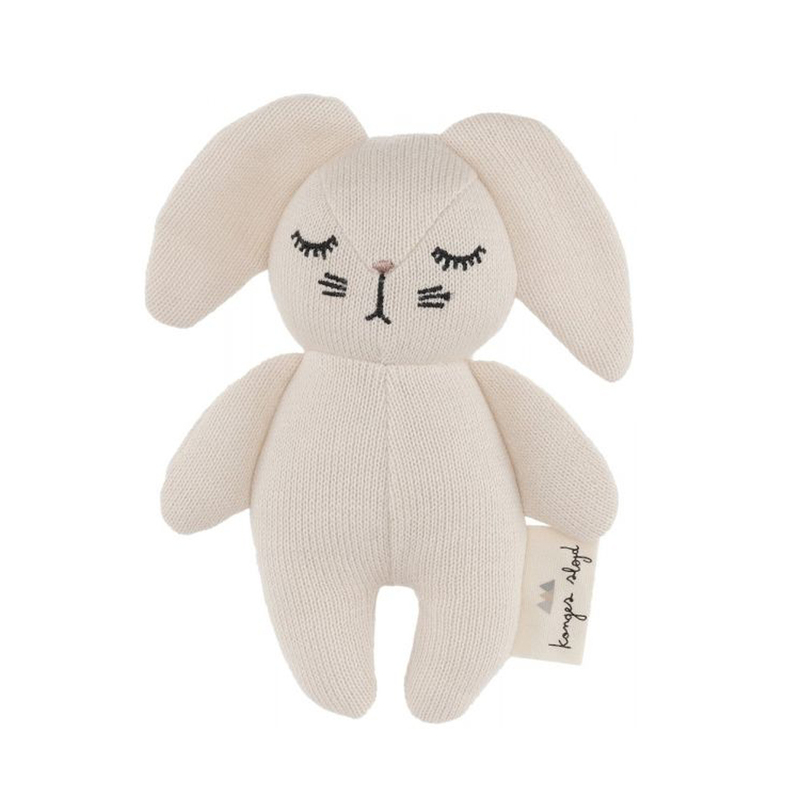 Keep your little one entertained with this adorable Mini Rabbit from Danish brand Konges Slojd. The Konges Slojd Mini Rabbit comes in a gorgeous off white shade that conveys a modern Scandinavian aesthetic. Made from oekotex cotton knit and tested to European safety standards, this toy is destined to become a favourite. Clean with a soft damp cloth. Not machine washable. Konges Slojd designs simple Scandinavian-style products for babies and children. Based in Copenhagen, Denmark, the brand fuses a timeless vintage aesthetic with modern styling to create products that will work in almost any decor. Konges Slojd was founded in 2014 by designer Emilie Konge Breindal and now offers a diverse collection of quality-conscious interior products and clothing for children. All products are manufactured under ethical working conditions and with a focus on sustainability. The most recent range of bedding products are made only with GOTS certified organic cotton. Our gorgeous range of Konges Slojd products includes beautiful cot bedding sets and stunning nursery products designed to charm and delight the little one in your life. These products make ideal presents to welcome a newborn. A large Maileg Brown Sister Bunny measuring 53cm. 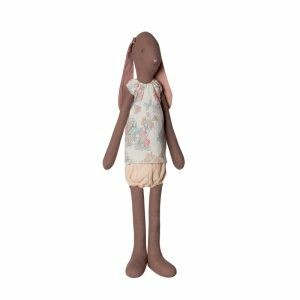 A Maxi Bunny sturdily made from cotton with a sweet embroidered face, lovely floppy ears and comes dressed in a pretty vest and floral print pants. This classic, timeless doll is sure to be treasured for a forever. 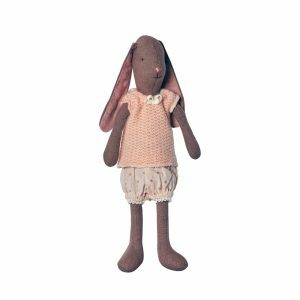 Maileg’s Maxi Bunny makes for a sweet gift as well as a great start or addition to your child’s own Maileg collection. A small sized Maileg Brother Rabbit measuring 26cm. 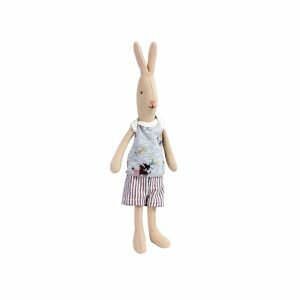 A Mini Boy Rabbit sturdily made from cotton with a sweet embroidered face and dress in a cotton farmyard print vest and spotted pants. 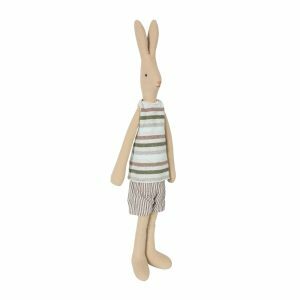 Maileg’s mini boy rabbit makes for a sweet gift as well as a great start or addition to your child’s own Maileg collection. This classic, timeless doll is sure to be treasured for a forever. All Rabbits and Bunnies come dressed in their underwear and are machine washable. Maileg Sister Rabbit measuring 107cm. A Mega Maxi Rabbit sturdily made with a well stuffed cotton body, long ears, dangly legs and arms and lovely face. Don't forget the lovely details on the removable clothes! This classic, timeless doll will be a very special gift treasured for a lifetime. 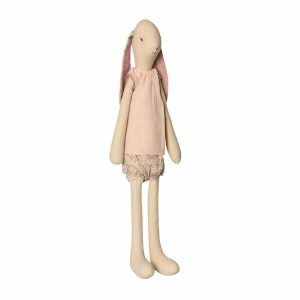 Maileg’s Mega Maxi Girl Rabbit makes for a sweet gift as well as a great start or addition to your child’s own Maileg collection. Underwear pattern may vary to image shown. A small sized Maileg Brown Sister Bunny measuring 26cm. A Mini Bunny sturdily made from cotton with a sweet embroidered face and dress in a floral cotton vest and pants. Maileg’s mini girl bunny makes for a sweet gift as well as a great start or addition to your child’s own Maileg collection. This classic, timeless doll is sure to be treasured for a forever. All Rabbits and Bunnies come dressed in their underwear and are machine washable. Please select an outfit. Underwear pattern may vary to image shown. A large Maileg Sister Bunny measuring 53cm. A Maxi Bunny sturdily made from cotton with a sweet embroidered face, lovely floppy ears and comes dressed in a pretty vest and floral print pants. This classic, timeless doll is sure to be treasured for a forever. 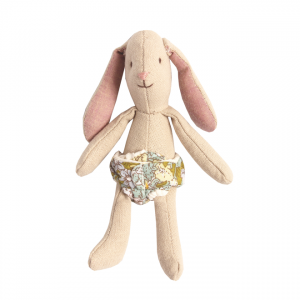 Maileg’s Maxi Bunny makes for a sweet gift as well as a great start or addition to your child’s own Maileg collection. All Rabbits and Bunnies come in their underwear. Please select an outfit. Underwear pattern may vary slightly to image shown.